There's really no good reason not to own at least one version of this magnificent send off. The word "legend" is thrown around with reckless abandon in the music world these days, but when you apply it to someone like Jon Lord, nobody will argue. A composer, consummate musician, gentleman and pioneer, Lord can lay claim to being a founder member of Deep Purple, a skilled classical composer, the man who fused Hard Rock and Classical music together via his famed 'Concerto For Group And Orchestra'...whatever you remember him for, you can appreciate what a massive loss he was to music. It's only fitting that he was remembered at this amazing concert at the Royal Albert Hall and this lavish set, spanning two DVDs and three CDs, manages to bring together a wide ranging collection of talent to pay tribute to the great man. The concert, compered by Bob Harris, is divided into two halves. The first celebrates "Lord The Composer", cherry picking a handful of Lord's pieces from his many solo projects, performed impeccably by the London Philharmonic Orchestra under the guidance of Paul Mann. The instrumental movements are nicely interspersed with vocal selections such as 'All Those Years Ago' performed by the excellent Steve Balsamo, accompanied by Micky Moody on guitar. Miller Anderson receives rapturous applause for his performance of 'Pictured Within' while Margo Buchanan absolutely nails 'One From The Meadow'. Rick Wakeman steps up to perform keyboards on 'Sarabande' while Jeremy Irons strolls onto the stage to deliver a suitably somber and dramatic reading of 'Afterwards'. The second half celebrates "Lord The Rocker". Paul Weller delivers two songs from Lord's pre-Purple act The Artwoods which are lively and enjoyable, while Ian Paice and Bernie Marsden reunite to perform a couple of Paice/Ashton/Lord numbers, with The Temperance Movement's Phil Campbell handling the vocals. Balsamo returns with Sandi Thom to deliver a beautiful orchestral rendition of Purple's 'Soldier Of Fortune' before the crowd erupts at the arrival of ex-Purple vocalist Glenn Hughes and Iron Maiden singer Bruce Dickinson. The pair duet Purple's 'You Keep On Moving' and 'Burn' and work very well together, receiving a standing ovation before Hughes is left to deliver 'This Time Around'; the one song he and Lord wrote between them. He steals the show with an absolute vocal master-class of which Lord would surely have been proud to witness. Then it comes to the turn of Deep Purple themselves. They strike up with a couple of songs from their superb 'Now What ?!' album, with 'Uncommon Man' opening proceedings before 'Above And Beyond', dedicated to Lord, impresses. Ian Gillan, dressed in an amusing T-shirt with a tuxedo design printed on it, sings better than he has for quite some time, doing a great job on 'Lazy' and delivering a spectacular 'When A Blind Man Cries'. 'Perfect Strangers' and 'Black Night' work well, especially bolstered by the orchestra, before an all-star jam of 'Hush' brings proceedings to an end. It's a fitting celebration of the work of one of the "true greats" of the music world, whether you view it on Blu-Ray, DVD or simply listen to the CDs. 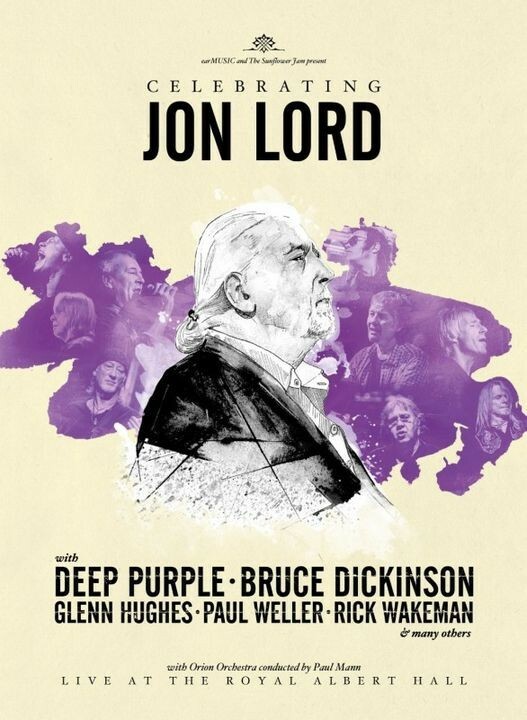 The material and performances are of exceptional standard and with all proceeds going to the Jon Lord Fellowship, which was set up to help in the fight against cancer, there's really no good reason not to own at least one version of this magnificent send off.